What is a Conservation Binding? The term “conservation binding” gets thrown around a lot. It certainly sounds different than just rebinding a book. But what does it really mean? It is unknown who coined the term, and a google ngram search shows its use beginning in the 1960s, and peaking in the 1980s. It wouldn’t surprise me if it actually started in the 1950s in England. The 1980s were the peak of rebinding in book conservation, which resulted in many treatments that we would now consider too invasive. But the ethos then was to treat a book so that it would last 500 years. Of course, the correlation between the use of the term and making a conservation binding is not known. The trouble is, it doesn’t have any agreed upon meaning, similar to the even more ubiquitous term “archival”. All the usual suspects for bookbinding terminology — Language of Bindings, Carter, Etherington, The Multilingual Bookbinding and Conservation Dictionary — don’t have an entry for conservation binding. 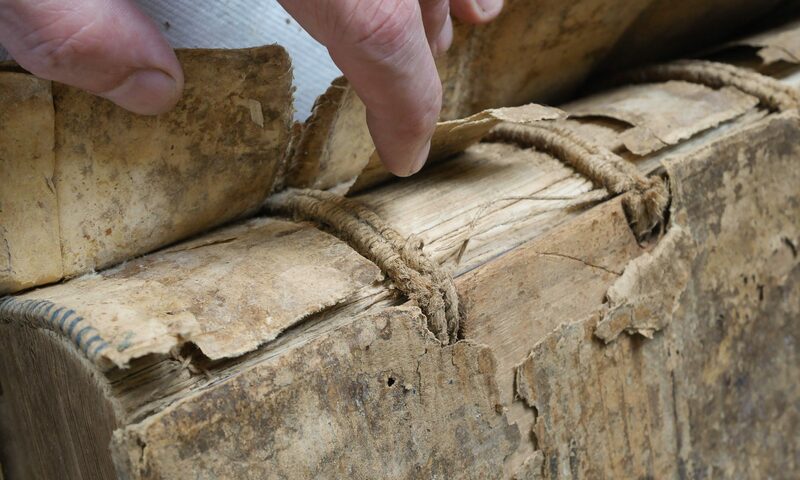 In practice, it can simply mean a binding done by a conservator. And anyone can call themselves a conservator. Or it can often mean a reversible layer of paste and Japanese tissue on the spine of a fine binding. Or it can imply the use of durable and modern conversationally accepted materials (i.e. linen, handmade paper, tawed skin) incorporated into a binding, with minimal attention paid to decoration and finishing. A conservation binding is a rebinding that is structurally similar and aesthetically sympathetic to the time the text was printed. It is durable, easily reversible, non-damaging and alters the original binding materials as little as possible. It does not fool someone into thinking it is an original binding, though it is harmonious with actual historic bindings. Jeff — I intended to add a note to this post, and I am belatedly doing so! You might find it interesting to skim a paper I wrote and delivered in Oxford, England, in 1975, and which is now posted on my bepress site: https://works.bepress.com/shuttner/22/. I don’t believe I used the term “conservation binding,” and frankly, I do not remember its being in use in my hearing (or reading), but it certainly expresses what I, and others, thought we were doing at the time. Among “others” I include librarians, binders, and binding historians with whom I worked and from whom I learned. Although most of you folks in active practice today are too young to personally remember the 1970s, I think I am correct to say that the University of Chicago in that period, correctly or unwisely, had the most thoughtful and aggressive commission-based conservation program in library-land. While a (very) few libraries still had inside binderies (whose practices were being shunned by Special Collections staff), most “conservation programs” were limited to semi-systematic oiling leather in-house and the occasional commissioned “restoration” of an important item by an outside conservator. The Newberry Library, under Paul Banks’ care, was a rare exception. In-house conservators and laboratories, as well as binders trained apart from the bench, first began to develop in the 1980s and 1990s. My apologies for the photographs, made from slides and here much reduced in size. The text, however, as I intended then and remember now, captures rather well I think a sense of the moment in which it was written. Thanks for this relevant oral history, Sid! The timeframe (and concept) make perfect sense for a Gary Frost/ Paul Banks Newberry era use and coinage? Now having a chance to read your article, I’m struck by how well the Barbara Giuffrida limp vellum bindings fit in with modern conceptions of a conservation binding. The Carolyn Horton rebacks (at least the ones without the gold labels) also look very in line with modern conservation aesthetic sensibilities. Thanks for sharing!